Have you ever thought about packing it all up, putting your working life on hold temporarily and taking time out to travel with your loved ones? For some it's a pipe dream. Something you would love to do but the reality is a little daunting. For Emma Burton however, a night out in Newcastle upon Tyne last year ivolved more than a fun night out with her husband, Paul, it led to a conversation which saw the couple pack up their belongings, buy a motor home and take off to see the sights around Europe with their two beloved dogs, Ozwena (Ozzie) and Uluru (Roo) in tow. So far we have driven over 10.000 miles, visited twelve countries and have met so many other dog owners from all over the world during the last 11 months of travelling Europe in our motorhome with Ozzie and Roo. We had a family party and friend’s wedding to attend back in the UK so we planned a trip home for a couple of weeks to join the celebrations. This involved us getting the dogs vet checked and approved to comply with travel regulations for pets in/around Europe. Our departure date was approaching and our ferry booked to take us back to the UK. In Belgium we started our search for a local veterinary practice that could stamp the dogs passports and administer the worming treatment that is required. 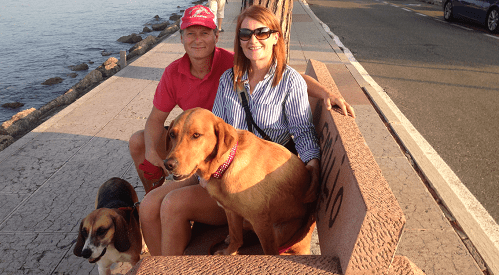 We had spoken to lots of other dog owners about this whilst travelling in Europe and it seemed to be a simple process but I was feeling a little apprehensive as this was the first time we had done this and I wanted everything to go as smoothly as possible. After researching online I discovered that a worming treatment needs to be carried out to all animals to travel back to the UK and this needs to be done within 24 to 120 hours (one-five days) before you travel. After another Google search I found a practice in Ypres where we were staying so with Ozzie and Roo in tow we headed to the address which took us to a grand old building with a small doorway and a bell with a picture of a dog on it, so we guessed we were at the right place. We were ushered inside the surgery which was very grand with lots of stuffed ferrets and weasels mounted in glass cabinets on the walls, high ceilings and dark wood furnishings. The vet greeted us but spoke very little English and our crash course in Flemish beforehand didn’t come in very useful either. My communications to the vet involved acting out being on a ferry and he gave me a puzzled look, I then produced the pet passports from which he nodded and had the medication in the form of an injection. A poorly kitten was in a cage underneath the table next to us that was whining to be let out and this distracted the dogs from the large needle the vet injected both dogs with. The vet then signed our pet passports and stamped them with his approval to confirm they were now legally allowed to travel. This is the important part of this process, without the treatment and dated stamp dogs will not be allowed to travel. The cost was 34 Euros per dog and only took a few minutes before we were back out into the busy streets of Ypres. We have heard varying stories of costs and we know that some dog owners take their own worming tablets with them and ask the vet to administer them to reduce the costs. We didn’t do this and were quite happy with the fee knowing we could now travel back home having the stamp of approval. After consulting my vet back in the UK when we got home he advised me that the vet in Belgium had treated both dogs for worms and ticks and confirmed that it is only necessary to have the worming treatment. So we were off, motorhome packed up and dogs walked, fed and snoozing on the back seats. Whilst we sat at the docks of Dunkirk ferry terminal we went through border control where the checks at immigration were carried out very thoroughly. Both Ozzie and Roo were scanned for their microchip and the officer checked both passports to correspond the ID numbers on their passports. The vet’s stamps were also checked along with the date and treatment that was given to them. After the checks we all boarded the ferry taking us from Dunkirk to Dover. Ozzie and Roo had to stay in the decks down below in the motorhome and we left them some treats, water and their favourite blankets. They were quiet and settled when we left them and happily snoozing. The first part of our journey was calm and the sea was like a lake so very little movement was felt however, it did start to become unsettled as the winds and sea started to rage. Paul and I were sitting on top deck and our coffees were making waves, and passengers were tottering about being thrown from one side of the ferry to the other. My heart was in my mouth throughout the crossing, my worry about the dogs in the vehicle deck below made me feel anxious for them. Ozzie and Roo are calm, confident and well behaved dogs but I was still concerned that they would be fretting with the amount of turbulence we were experiencing. If you ever travel with your pets please note that for this crossing they have to be kept below decks in the vehicles and no dogs are allowed in the main area of the ferry, nor are you allowed below decks once the ferry is moving so you cannot check on your vehicle or pets whilst in motion. Please bear this in mind if travelling with your pooches, as our crossing to France eleven months earlier had been very calm crossing the North Sea ,and when returning to the dogs back in the motorhome they were settled and had just woken them as we opened the door. However this crossing was something different and I couldn’t wait for the gates to be opened to get to see them both. As soon as I got in view of them their yelps of excitement filled the lower deck. I could see Ozzie sitting up tall on the front seat and she had her head thrown back and was howling at a high pitched scream. They were relieved to see us and soon settled once we gave them some treats and eventually then moved from the ferry onto dry land. It's worth noting that there are other travel options, if preferred, aside from ferries. The Euro tunnel, for example, has a shorter travelling time and you stay in the vehicle throughout the trip. A point to note here is that when booking online you must add your pet’s details. Back in Newcastle upon Tyne all of our home comforts were enjoyed, and seeing friends and family and reminiscing about our trip and inspiring those around us makes it all worthwhile. The book I have been collating whilst travelling is due to be released later this year in time for Christmas. This includes the experiences of our trip through the eyes of my dog Ozzie. She tells the story of where we have been and what mischief she has been up to. Ozzie is a Beagle with a huge personality and she has been up to all sorts of things from being rescued by Italian fishermen as she got swept out to sea, being kidnapped for the night by some local Spaniards, and falling from a cliff whilst staying in Portugal. Keep up to date with the adventures of the Burtons on twitter @BeagleBurton where you can also find out more about their new book and hear much more about Ozzie and Roo.